« Eugene Homeless Regulation Changes? Respondents were widely familiar with all three issues. QUESTION: How familiar are you with __________________________: very familiar, somewhat familiar, somewhat unfamiliar, or very unfamiliar? a.The City of Eugene plan to tear down the current City Hall building and build a new City Hall? b.The Eugene Civic Alliance plan to buy Civic Stadium? c.The City of Eugene requiring businesses providing services within the city limits to offer sick time to employees on an annual basis? 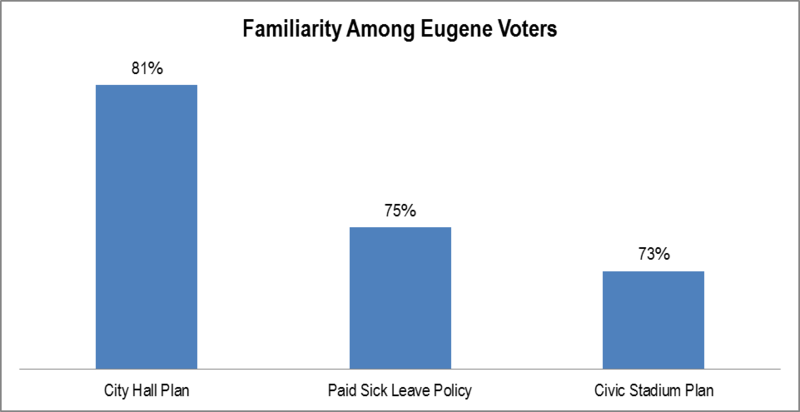 METHODOLOGY: 200 live telephone interviews of likely City of Eugene General election voters conducted December 2-3, 2014. The margin of error at the sample median is plus or minus seven percent.